The Big Bang collection embodies everything the watch manufacturer Hublot has done right over the last few years. Unusual materials, impressive designs, and intricate movements are all combined to make unique, unmistakable timepieces. Numerous limited editions, such as the Depeche Mode collection "The Singles"
The Big Bang plays a central role for Hublot as its flagship collection. It's certainly the most well-known watch from this Nyon-based manufacturer. The Big Bang is a true eye-catcher and head-turner. Lovers of complicated movements, as well as of exclusive materials such as Magic Gold (a gold and ceramic alloy), King Gold (a red gold and platinum alloy), and carbon, will certainly get their money's worth. One reason for this watch's success is its ability to combine contrasting elements. The watch's outer design is quite imposing, emphasized by case sizes of up to 45 mm and a wide bezel. This bezel has edges on a 90-degree angle and is held in place by six prominently visible H-shaped screws. However, the Big Bang is a watch of many faces. Models in the One Click series feature bright, popping hues, while the Big Bang Italia Independent offers a rather casual look. Versions with cases smaller than the standard 45-mm size are also available for men or women looking for a watch to fit a slimmer wrist. How much do watches in the Big Bang collection cost? The Unico series, named after the eponymous in-house caliber, offers the largest selection of typical Big Bang models. The chronograph movement allows for additional modules and can be outfitted with various functions, such as a second time zone or a perpetual calendar. Unsurprisingly, there are a number of iterations of the Big Bang Unico. The collection's top dog is the Unico 45. This imposing, 45-mm chronograph is available in a variety of materials, including titanium, carbon, sapphire, King Gold, and ceramic. As of Baselworld 2018, ceramic models no longer just come in black or white but also in bright red. Prices largely depend on the material used. For example, a red ceramic Big Bang Unico 45 costs around 22,100 USD since red ceramic is costly to make. A titanium Unico 45 is much more affordable at about 15,800 USD. You'll have to dig a bit deeper into your pockets for a King Gold model, which you can purchase for a good 30,300 USD. If you decide on the Unico 45 with a sapphire case and diamonds, be sure to have about 76,000 USD on hand. Announced in spring 2018, the Unico 42 falls in a similar price range from 17,500 to 47,000 USD. This timepiece is geared toward people who find a 45-mm case too large. Thanks to its modular design, the Unico movement can be expanded with additional complications. The Unico Perpetual Calendar, for example, has been outfitted with a perpetual calendar module. Prices for this 45-mm watch range from 41,000 USD for models in titanium or ceramic to over 90,000 USD for examples in sapphire or Magic Gold. If you're not looking to invest so much in a watch, you may enjoy the Unico GMT. While it lacks a stopwatch function, this timepiece offers a second time zone including a day-night display. If you choose a Unico GMT with a titanium or carbon case, you can expect to pay around 17,500 USD. Models in King Gold cost about 11,700 USD more. The Big Bang Unico Ferrari has been a part of the Hublot catalog since 2012. The product of a collaboration with the Italian sports car company, it has a sporty design with red or yellow numbers and matching seams on the band. Carbon and ceramic are the dominant materials used, and the watch is powered by the Unico chronograph caliber, which includes a flyback function. Depending on the material, this sporty watch costs between 21,000 and 33,000 USD. Hublot reached the pinnacle of watchmaking with their HUB6016 caliber featuring a tourbillon. The delicate frame turns the balance wheel 360 degrees once every minute, thereby negating the effect of gravity on the oscillation system and resulting in a more accurate watch. Tourbillons are considered one of the most difficult complications to produce and are therefore reserved for especially high-quality watches. The HUB6016's massive power reserve of around 115 hours is also very impressive, and a subdial at 9 o'clock serves as the power reserve indicator. Of course, Hublot creates these timepieces using a variety of materials. Cases in gold, titanium, sapphire, or ceramic are paired with bands made of rubber or alligator leather. A model with a diamond-studded bezel joined the Tourbillon family in spring 2018. The titanium Big Bang Tourbillon is the collection's entry-level model at around 63,000 USD. Those in ceramic, gold, or sapphire go for between 70,000 and 88,000 USD. The power reserve is the most important element of the Big Bang Meca-10 and Big Bang MP-11. The manually-wound caliber HUB1201 powers the Meca-10 and can run for ten days straight when fully wound. Announced at Baselworld 2018, the MP-11 boasts an even more impressive 14-day power reserve. 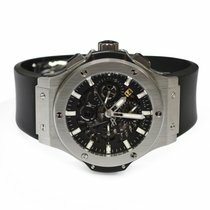 This is thanks to its HUB9011 caliber with a row of seven barrels, which have made the watches in Hublot's MP series famous. However, all this power comes at a price. A black carbon MP-11 costs around 64,300 USD, while sapphire models sell for almost 82,000 USD. In contrast, the Meca-10 looks like a bargain at between 17,500 and 28,100 USD, depending on the material. If you'd prefer something a bit less imposing, you should take a look at the standard edition Big Bangs. These watches are 38, 39, 41, or 44 mm in diameter, making them interesting for both men and women. It's not only the size that differentiates these timepieces from their sister models: They also have solid dials. Hublot uses colorful gems on the bezel and bright, flashy bands for added pizazz. What's more, each size is also available with diamond embellishments for even more of that bling-bling. Hublot has outfitted the two larger versions with automatic chronograph calibers, namely the HUB4100 and HUB4300. Both have a 42-hour power reserve. Expect to spend about 11,700 USD on models with a steel or carbon case. Those in gold with diamonds on the bezel can easily cost up to 26,300 USD. The 38 and 39-mm pieces are both three-hand watches, the smaller of which features a quartz movement. The case of the 38-mm model comes in gold, steel, or ceramic and is ornamented with diamonds. This timepiece goes for anywhere from 8,800 to 17,500 USD. The Big Bang 39 is also known as the 'One Click.' Hublot has equipped it with a system that makes changing its band quick and easy. These watches also feature diamonds or colorful sapphire crystals on their bezels and cases. Prices sit between 11,700 and 23,400 USD. Hublot is constantly drawing attention to itself with the release of limited edition watches. The Big Bang collection also includes some of these exceptional pieces, such as the Big Bang Sang Bleu designed by Swiss tattoo artist Maxime Büchi. Büchi is known for his geometric style, which he used for the Sang Bleu. Instead of hands, this timepiece tells the time using three skeletonized, octagonal, overlapping disks. The Sang Bleu is available in titanium, gold, steel, or ceramic. The case comes in two sizes, 39 or 45 mm, and with or without diamonds. Plan to spend between 16,400 and 37,500 USD on one of these watches. The synth-pop band Depeche Mode and Hublot have had a partnership for several years. In this time, there have been many special models in the band's honor. Most are a reworked version of the Big Bang Unico with a rubber strap and a studded calf leather cuff. The Depeche Mode collection "The Singles" was released in 2018 and is strictly limited. Each of the 55 individual watches represents one of the group's 55 singles. The bands match the dial, which features the respective single's cover art. These timepieces are sold in a Rimowa suitcase with the corresponding 12-inch vinyl single and a Roland JP-08 synthesizer. Set aside around 25,700 USD for one of these pieces. If you could go for something a bit less exclusive, you can get the standard version of the Depeche Mode watch, which is limited to 250 pieces, for about 5,900 USD less. Hublot also has a strong relationship to soccer. 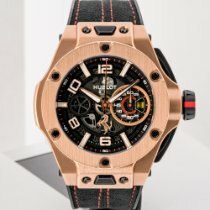 Fans of FC Bayern München, Juventus Turin, Benfica Lissabon, and FC Chelsea can buy special, club-specific timepieces for between 11,700 and 21,100 USD. What's more, Hublot releases limited edition pieces for major events, such as the UEFA Champions League, Europa League, European Championship, and FIFA World Cup. Prices for these models come in at around 23,400 USD. Hublot released the first smartwatch in the company's history for the 2018 FIFA World Cup in Russia: the Big Bang Referee. This watch is limited to 2,018 pieces and costs about 5,900 USD. The colorful Broderie, Pop Art, and Tutti Frutti models were a part of the Big Bang collection until 2017. The Broderie features embroidery on the dial, bezel, and band. Matching sapphire crystals also ornament most of the bezels. Depending on the case material, plan to spend between 12,900 and 27,000 USD on a Big Bang Broderie. The Pop Art is dominated by bright colors, combining pink, orange, turquoise, and green all on one watch. These timepieces cost anywhere from 10,500 to 21,100 USD. The Tutti Frutti is slightly less colorful. Most models have a matching dial and band in orange, pink, or blue. Some editions feature a white or black dial combined with a colorful band. These timepieces demand between 14,000 and 29,500 USD. The Big Bang Jeans feels especially casual and is also no longer in production. Hublot created this watch using blue denim for the strap and dial. 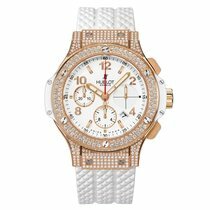 The Swiss manufacturer conquered the challenge of combining conflicting materials by enhancing some Jeans models with diamonds on their dials and bezels. A Big Bang Jeans costs around 12,900 USD. The Big Bang has been causing a stir since its introduction in 2005. The watch immediately won many awards, such as the design prize from the Geneva Watchmaking Grand Prix and the prize for sports watches at Watch of the Year 2005 in Japan. Since then, Hublot developers have been updating the collection's look through the use of innovative materials such as Magic Gold, in addition to continually introducing new calibers. Hublot was the first company to manufacture watches with natural rubber straps, which are also available for the Big Bang. The combination of these bands and cases often made of gold or high-tech materials results in an intriguing mix. In many Big Bang models, the caliber presents another contrast to the large cases. Many calibers are intricately designed and richly decorated. Some watches feature sapphire glass case backs and no dials, allowing you to observe the moving work of art from both sides.